In what can be dubbed as one of the largest environmental fines in Indian history, the National Green Tribunal (NGT) in early January asked Pune-based Goel Ganga Developers to pay a whopping Rs 195 crore towards the “restoration and restitution of environmental damage” caused due to its illegal construction activities and for contravening environmental laws. While the real estate giant has moved the Supreme Court challenging the NGT decision, this is not the first time the special tribunal, established over seven years ago for effective and expeditious disposal of environment-related cases, has found itself in the eye of the storm for taking polluters to task. In 2016, NGT set a precedent by holding a private company responsible for damages precipitated by natural disaster. 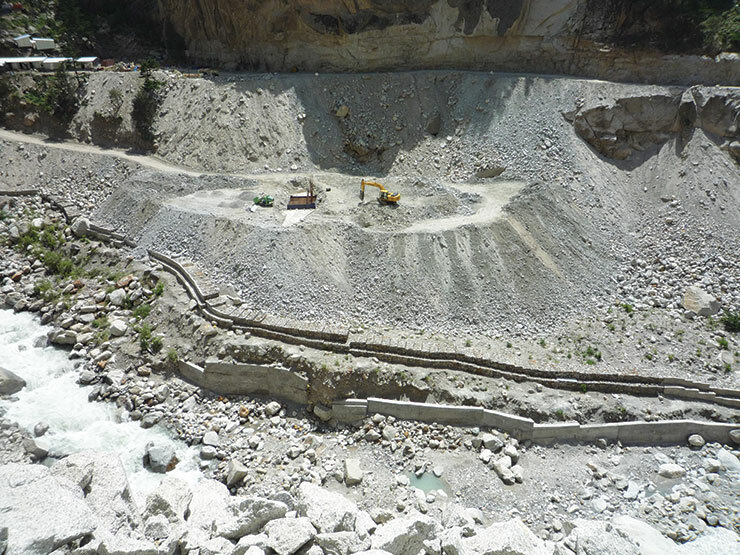 The tribunal determined that the June 2013 flood in Uttarakhand’s Srinagar town caused large losses to property and even life because the Alaknanda Hydro Power Corporation Ltd (AHPCL) had dumped a huge amount of muck on the riverbed while building the Srinagar dam. NGT thus asked AHPCL to pay Rs 9.26 crore as compensation to those affected by the floods. But the GVK group, which owns AHPCL, has challenged NGT’s decision in the apex court. 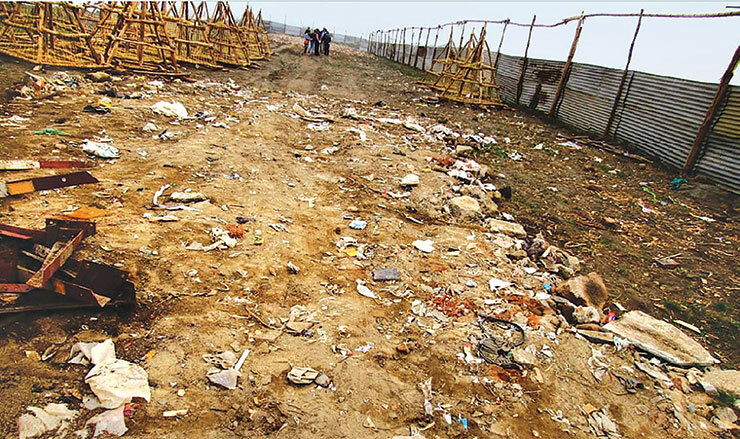 In a similar high-profile verdict that year, the tribunal had imposed Rs 5 crore on the Art of Living Foundation, a UN non-profit known for stress-relief courses, as restoration costs for damaging the fragile ecosystem of Yamuna floodplains during its three-day World Culture Festival. The foundation’s head Sri Sri Ravi Shankar has since mocked the NGT, scoffed at it in a Facebook post and moved the Supreme Court, saying that NGT’s verdict is unjust. In 2015, the principal bench of NGT imposed a fine of Rs 25 lakh on Triveni Engineering Industries, a sugar and distillery company in Uttar Pradesh, for contributing to the pollution of Ganga. The tribunal noted that the company has "polluted the groundwater and air, has operated without consent of the board (at times), and has breached the conditions of the consent order". However, the bench found it difficult to ascertain the compensation and took recourse to guesswork to determine penalty. Subsequently, NGT applied such "guess work" while imposing environmental compensation on other industries. In fact, multiple NGT orders and pending decisions are facing ire from different fronts, says the latest report by Delhi-based non-profit Centre for Science and Environment (CSE). This is irres- pective of the fact that the special tribunal has emerged as an important institution to deal with environmental violations since it was established under the National Green Tribunal Act 2010—till February 2018, it has heard and disposed 87 per cent of the 25,254 cases brought to its notice. At the core of most disputes, says the CSE report Green tribunal, green approach, is the way NGT uses an age-old principle of environmental jurisprudence—polluter pays. Legal experts say there are broadly two rationales behind the polluter pays principle, which has been a major pillar of most environmental cases worldwide. First, a penalty discourages anyone from polluting the environment; makes the polluter consider its “unlawful activities”; or factor in pollution costs before embarking on new projects. Second, a penalty acts as compensation for communities that have suffered due to pollution; or shift the monetary responsibility of rectifying ecological damage from the government to the polluter and thereby save taxpayer money. But the efficacy of the principle depends on the penalty or compensation amount and how it is administered. The penalty or compensation amount is a reflection of the seriousness of the violation and remediation cost of environmental degradation, notes the CSE report. Therefore, the precision or certainty with which a penalty or compensation is calculated is important to achieve the intended result. However, herein lies the problem. Though directives of NGT provide explanations on liability of payment, factors are rarely cited as to how the amount has been computed. And in the absence of a clear penalty computation method, NGT has at times mentioned relying on “guess work”, notes the report. Consider this. 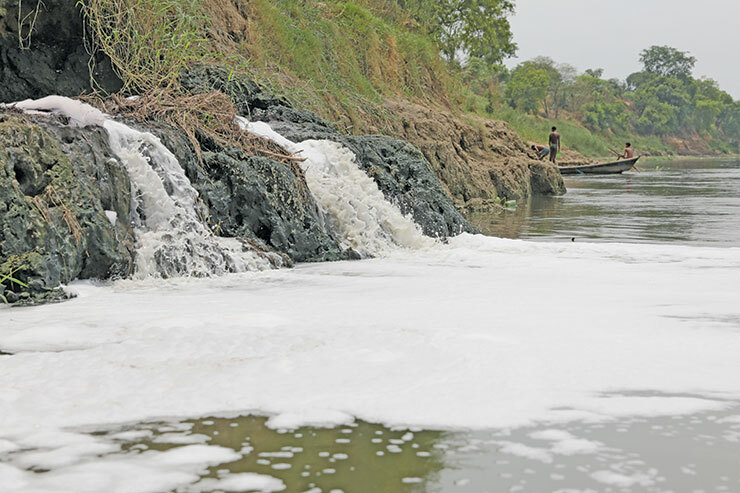 In December, 2015, the Principal bench of NGT slapped a fine of Rs 25 lakh on Triveni Engineering Industries, a sugar and distillery company in Uttar Pradesh, for contributing to the pollution of the Ganga. The company has “polluted the groundwater and air, has operated without consent of the Board (at times), and has breached the conditions of the consent order”, the tribunal noted. However, the bench found it difficult to ascertain the compensation and took recourse to guesswork to determine penalty. “At this stage it is not possible to determine with certainty the extent of pollution caused and consequences of the violations committed by the industry and therefore some kind of guesswork has to be applied by the Tribunal to direct payment of environmental compensation,” it said, while delivering the verdict. Subsequently, NGT went on applying such “guesswork” while imposing an environmental compensation of Rs 1 crore on DSM Sugar Distillery Division in Uttar Pradesh’s Sambhal district. “In order to examine what environmental compensation should be directed to be paid for restoration as well as for preventive measures that are required to be taken now, we have to apply some kind of guesswork as the pollution has been caused over the years,” said Justice Swatanter Kumar, while delivering the judgement. 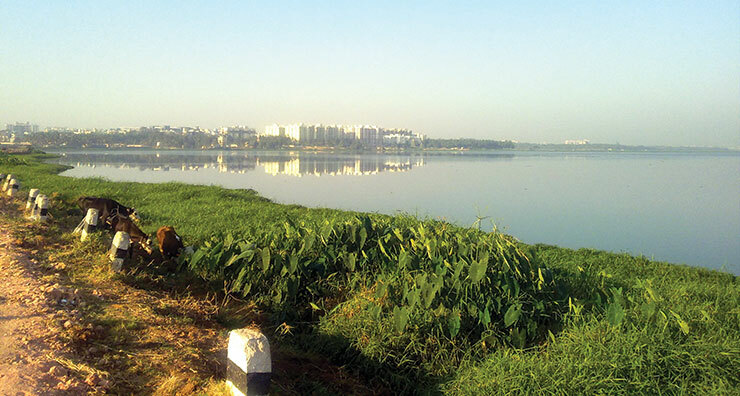 In May 2015, NGT slapped a fine of Rs 117.35 crore and Rs 22.5 crore on Mantri Techzone and Coremind Software & Services Ltd for unauthorised constructions in the eco-sensitive area between Agara and Bellandur lakes in Bengaluru. The penalty was 5% of the project cost. It was one of the few occasions, where NGT based its decision on a precedent. It was inspired by a 2014 Supreme Court ruling that said mine lease holders should pay 10% of their "sale proceeds". But instead of "sale proceeds", NGT used "project cost" as the basis of imposing fine. It also lowered the penalty amount to 5% as it felt 10% was somewhat on the higher side. Whether stated or not, guesswork or uncertainty seems to be at the helm of all cases where NGT uses the polluter pays principle. Initially, when Tanaji Gambhire had filed a plea against Goel Ganga Developers in 2016, NGT had asked the developer to pay Rs 100 crore as environmental compensation cost. A year later, Gambhire appealed the NGT for reviewing the judgement, saying it had not considered his affidavit for quantification of environmental compensation based on the carbon footprint generated by the project. Acting on Gambhire’s review petition, NGT doubled the compensation amount. However, the verdict had no mention of parameters on the basis of which it calculated the project’s carbon footprint and arrived at the Rs 195 crore figure. In the absence of a proper methodology to compute penalty, legal experts say the amount can be too low to act as a deterrent. In 2014, the green tribunal imposed a fine of Rs 5 crore on Simbhaoli Sugar Mill and Distillery unit in Uttar Pradesh for polluting the Ganga. The order followed a petition by local resident Krishna Kant Singh, who claimed that the units were discharging toxic effluents into a Phuldehra drain which eventually joins the Ganga between Garhmukteswar and Narora, a Ramsar site known to harbour dolphins, turtles and other aquatic fauna. NGT also directed Simbhaoli mills to remove the sludge and clean Phuldehra drain within three months, failing which it would be liable to pay another Rs 1 crore. That year, while hearing a similar case of pollution by the Daurala Sugar Works Distillery Unit in Uttar Pradesh, NGT imposed a penalty of Rs 1 crore on the company. When compared to the companies’ annual turnover, Simbhaoli Sugar Mills had to pay 5 per cent of the 2014-15 turnover of its alcohol producing unit alone; Daurala Sugar Works had to pay a mere 0.07 per cent of its total 2014-15 turnover of about Rs 1,305 crore. “Can such small penalties act as deterrents for the sugar and distillery units,” question CSE researchers. “It does not matter whether the penalty amount is big or small,” says environmental lawyer Ritwik Dutta, who has dealt with a number of cases at NGT. It is more about affecting the reputation of the company at fault. This makes the community feel better because they went to court and got justice. It also teaches polluters a lesson, Dutta says. 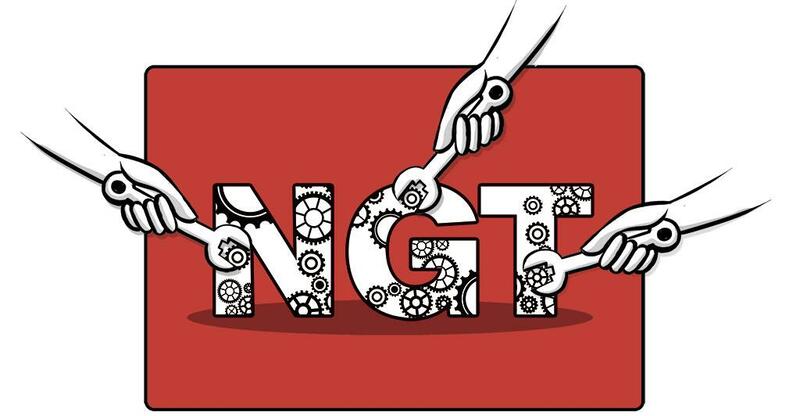 Most NGT lawyers and expert members who have served the green tribunal admit that there is a lack of method for determining penalties in the various cases reviewed. However, some argue that the tribunal cannot be blamed solely in this matter. “The perspective of applicants matter substantially (in deciding the penalty amount),” says D K Agarwal, former expert member of NGT. 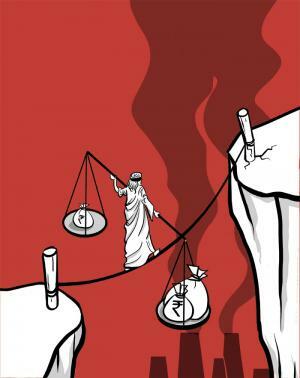 “For most compensation cases filed before NGT, the fault also lies with petitioners and applicants who do not make a proper assessment of the damages before filing the cases. Overall, the awareness level on scientific approaches for claiming damages is very low. During my tenure in NGT, I came across only two instances where the applicants had made such an effort. This puts a heavy burden on the judge,” Agarwal adds. In January 2016, NGT imposed a fine of Rs 25 crore on Adani Hazira Port Private Ltd, a wing of the Adani Group in Gujarat, as a cost for the environmental degradation and mangrove destruction caused by port activities. The order was passed in response to a petition by the Hazira Fishermen Association, which said the multi-crore project has damaged the ecology and their livelihood. Adani challenged the order of NGT in the Supreme Court (SC). After the SC also asked Adani to pay the penalty, the company deposited the penalty amount with the district collector of Surat in March 2016. However, the money is yet to be used to compensate the affected fisherfolk of Hazira or restore the mangroves around the port. Occasionally, NGT has managed to cite the methodology for computing the penalty amount. However, CSE researchers say in several cases the methodologies were not appropriate. For instance, NGT has imposed a fine on various developers for flouting statutory clearance requirements for construction projects. In five flagship cases analysed by CSE researchers, the penalty amount has been 5 per cent of the “project cost”. But what could be the rationale behind the number? An analysis of the verdicts shows that the figure has its genesis in a Supreme Court judgement. In April 2014, while hearing a case on irregularities in iron ore mining in Goa, brought by non-profit Goa Foundation, the apex court had said that mine lease holders should pay 10 per cent of their “sale proceeds” of iron ore mined towards a public fund—the Goa Iron Ore Permanent Fund. Does this form an appropriate parallel? Moreover, instead of “sale proceeds” as cited in the apex court judgement, NGT has taken “project cost” as the basis of imposing penalties. While the later can be a basis for estimating the earnings that a developer might have from infrastructure projects, it is not the same as sale proceeds, which can be roughly calculated by multiplying the units sold by the sale price of a unit within a particular period. The tribunal has also lowered the penalty from the Supreme Court’s directed 10 per cent to 5 per cent. “This was done as NGT found the 10 per cent amount to be somewhat on the higher side,” notes the CSE report. In January 2015, NGT ordered that whoever dumps debris in the Yamuna river shall be liable to pay compensation of Rs 50,000. Such compensation shall be used for removal of waste and restoration of the environment. The bench also prohibited throwing of puja materials or any other material like foodgrains and oil in the river, except at designated sites. Any person found to be disobeying this will have to pay a fine of Rs 5,000. But implementation failed as it was difficult to identify polluters. Delhi Development Authority officials say they initially levied fines and issued challans. But it became difficult to prove violations and constant monitoring involved advanced technologies and huge expenses. In 2015, while hearing a case against Nuziveedu Seeds Limited that developed a 100 megawatt hydroelectric power project on the river Tidong in Himachal Pradesh by violating forest clearance, NGT imposed an initial fine of Rs 5 crore on the agribusiness company. It imposed the fine on the grounds that the company had destroyed forests in the river basin while developing the Tidong dam. As it was not elaborated how the tribunal arrived at the amount, a committee was set up to review the matter further. When the committee submitted its report, the charge did not commensurate with the ground reality. The committee observed that the estimated damage was far less and the company had already paid various compensation costs as required under forest laws. The principal bench of NGT got caught up in uncertainty following this and put the payment on hold. But what about the payment that companies have coughed up as per NGT directives over the past years? Have authorities used the money for mitigating environmental damages? How effectively is this monitored? CSE analysis shows there is no centralised mechanism for monitoring the ground imple mentation of NGT orders, let alone the utilisation of the compensation money. The pursuit is comp letely on a case to case basis. Under the existing law, there is a specific mechanism for payment after NGT slaps a fine. Section 24 of the National Green Tribunal Act, 2010 requires that penalties imposed by NGT have to be deposited in the Environment Relief Fund (ERF), especially created for this purpose. This fund has a manager, and currently, the United India Insurance Company Ltd is entrusted with the task. The NGT (Practices and Procedure) Rules 2011 further specify that the amount should be remitted to ERF within 30 days from the date of the order of the penalty, or as otherwise ordered by NGT. ERF is supposed to maintain a separate account for the purpose of receiving and disbursement of the penalty amounts as directed. 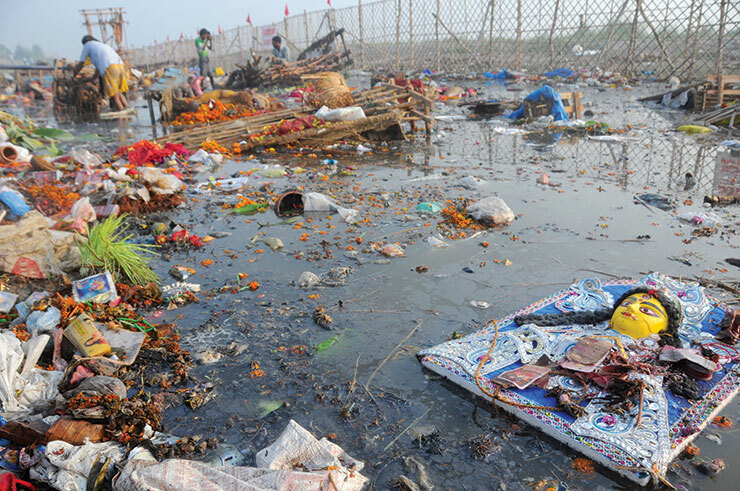 In a high-profile verdict in 2016, NGT imposed Rs 5 crore on the Art of Living Foundation as restoration costs for damaging the fragile ecosystem of Yamuna floodplains during its three-day World Culture Festival. The foundation's head Sri Sri Ravi Shankar has since mocked the NGT, scoffed at it in a Facebook post and moved the Supreme Court, saying that NGT's verdict is unjust. However, an expert committee has told NGT that a whopping Rs 42.2 crore would be required to restore the damaged Yamuna floodplain. However, the CSE report shows that payments are rarely deposited in ERF. In fact, in a majority of cases, NGT directs the money to be paid to various other administrative authorities, including state- and district-level bodies like pollution control boards, environment and forest departments and district collectors. CSE researchers reviewed some 60 cases where different NGT benches have imposed direct fines on the polluter. In about 40 per cent of cases, the payment was directed to be made to the state pollution control boards (SPCBs) or pollution control committees. In 17 per cent cases, NGT has directed the polluter to pay the state environ ment and forest departments and in 10 per cent of cases to the district authorities, such as the district collector. While payments were directed to ERF only in 12 per cent of the cases, in a few cases, payments were asked to be made directly to the affected community. B S Sajwan, former expert member at NGT, admits that in most cases the green tribunal directs environmental compensation to SPCBs. This is to ensure environmental restoration, he adds. “Under the arrangement, SPCBs are required to prepare an environmental resto ration plan for the area in question and imple ment such a plan with the approval of the green bench. So, it is not just that the money is being asked to be deposited, but the second aspect of how the money would be used for restoration is also attended to,” Sajwan adds. BUT DO PENALISED POLLUTERS PAY? To get an insight into the matter, CSE researchers filed queries under the Right To Information (RTI) Act, 2005, spoke to lawyers and industry insiders, and the response showed three discer nible trends. First, of the seven of CSE’S sample cases where NGT had directed payments to be made to ERF, only two, or 28.5 per cent, of the polluters had paid up. Second, it appears that polluters accept NGT’s decisions if the penalty amount is not too high. For instance, all the sugar and distillery units rapped for the Ganga pollution made the payments. “We do not want to remain caught up in disputes and litigation at NGT,” officials at Daurala Sugar Works in Meerut, Uttar Pradesh, said. Similar is also the case with DSM Sugar. The company had paid the penalty amount to the UP Pollution Control Board (UPPCB) within a month of NGT’s order. But payments become a bone of contention when the amount is high. In most of the cases analysed by CSE, polluters slapped with a hefty fine have appealed against NGT’s order in higher courts, which in turn have introduced a stay order for the interim. Delhi-based environmental lawyer Sanjay Upadhyay agrees that typically all big penalties or compensations awarded by NGT are either stayed by higher courts or put on hold due to some other reasons. But what happens to the money that reaches the ones entrusted with the responsibility of environmental restoration? CSE researchers tried to review the extent of compliance with NGT orders, and the results were disheartening. In July 2015, the principal bench imposed an initial fine of Rs 5 crore on Nuziveedu Seeds Limited Power Generation Ltd on the grounds that the company had caused damage to forests in Tidong river basin of Himachal Pradesh while developing its 100-MW Tidong-I Hydro Electric Project. The Rs 5 crore was subject to further adjustments upon the examination of matters by an expert committee, which the NGT constituted after slapping the fine. However, the committee report suggested that the estimated damage was far less and the company had paid many of the compensation costs as required under forest laws. The NGT bench has subsequently put its decision on hold. For example, in the case of Ganga pollution by Simbhaoli Sugars Limited, NGT had asked the company to pay Rs 5 crore as restorative measures to UPPCB. While the company made the payment within eight months, not much progress has happened with respect to work even three years after payment. The progress of implementation is equally poor for many others. NGT experts agree about the delay in implementation. “I admit that a lot of gap persists between money deposited to pollution control boards and the action plan,” says Sajwan. However, the problem of poor disbursal and utilisation of funds is not just with SPCBs. “Fund disbursement by any authority is typically poor, be it ERF, SPCB or the state environment and forest departments. In the absence of a well-defined mechanism of fund utilisation, it is likely to become like other funds where money accumulates over the years,” says Agarwal. There is also a need for clear centralised mechanism to review how orders are being implemented, says Ranjan Chatterjee, former expert member of NGT. In the absence of this, tracking and reviewing ground implementation of NGT directives become a case-to-case pursuit by individuals. As such Indian jurisprudence is not very well developed when it comes to assessing environmental damage. Without a proper mechanism, NGT will not be able to deliver intended natural and environmental justice. There is a real danger of the National Green Tribunal (NGT) becoming an ineffective institution. This may happen due to weaknesses in NGT’s own internal procedures as well as due to non-cooperation from the government, especially the Union Ministry of Environment, Forest & Climate Change (MOEF&CC). Let’s analyse these issues separately. Polluter pays principle is an important tool to address environmental violations. Seeing a polluter being made to pay for its offences instils confidence and a sense of justice in the society. Therefore, it is important that this principle is applied in a fair and objective manner. In addition, the money collected through fines and compensations must be effectively and transparently used for the benefit of the communities and the environment. As things stand today, compensations and fines imposed by NGT using the polluter pays principle lack clarity and objectivity. In several instances, it has applied “guess work” to impose penalty. The tribunal needs to establish clear guidelines and thumb rules—say, a guidebook on applying polluter pays principle—to estimate fines, damages and compensations. This will help it bring objectivity in its verdicts, make them less contentious and ensure timely actions on the ground. If it fails to do so, NGT will be in the danger of being perceived as arbitrary; and its orders would be challenged in higher courts and get caught in legal wrangles. For complex cases, NGT should identify institutions and engage with experts who can help it scientifically estimate the quantum of environ mental damages and remediation costs. But this will require a standard operating procedure. NGT has engaged external experts and set up committees in many cases. But this has typically been done after imposing an initial penalty NGT, however, has found it difficult to accept the committee’s recommendations, especially if the damages observed by the committee are lower than the penalty imposed. The case of Ajay Kumar Negi v Union of India stands as an example. Here, NGT imposed an initial compensation amount of Rs 5 crore on Nuziveedu Seeds Limited for causing damage to forest resources while developing its 100 MW hydroelectric project in Himachal Pradesh. Later, to assess conditions on the ground it set up an expert committee, comprising the state’s Additional Chief Secretary of Environment and Forest; Member Secretary of the state’s pollution control board and various other officials, and said the initial charge will be adjusted as per committee report. The committee found the damage was far less and the company had paid many of the compensation costs as required under forest laws. The company thus asked for a relief. However, NGT did not budge and put the payment on hold, saying “that stage is not yet matured for relief as solicited”. To avoid such conflicts, experts should be roped in from the beginning of the process. Also, there should be a mechanism to reconcile the difference in opinion that might arise between an independent expert committee and NGT. Then there is the issue of how the compensation and penalties should be used and by whom. The NGT Act requires that compensation and relief money should go to the Environment Relief Fund (ERF) managed by a fund manager. As the case stands, MOEF&CC has appointed the United India Insurance Company Ltd as the fund manager. However, NGT has not been using ERF in most cases. In a majority of cases, it asks payments to be made directly to other authorities, such as state pollution control boards, environment and forest departments and municipalities, who can execute its orders on the ground. But use of funds by these agencies is extremely poor. In fact, NGT has pulled them up time and again for this. There is a need to set up a proper institutional mechanism in partnership with MoEF&CC to collect and utilise compensation and penalties. Or else, NGT cannot hope to see proper implementation of its orders. But instead of cooperation, conflicts have marred the relations between NGT and MoEF&CC since beginning. In fact, these conflicts are resulting in institutional disarray. This can be particularly seen in the way NGT and MoEF&CC deal with cases related to environmental clearance (EC) violations. These are the cases where NGT has imposed heaviest penalties using the polluter pays principle. Among them illegal construction by developers without necessary EC and permits are significant. In the past three years, a number of such cases have come before NGT. One such flagship case is S P Muthuraman v Union of India which involved unauthorised construction by seven developers in Tamil Nadu. In July 2015, the principal bench of NGT imposed a total fine of Rs 76 crore on them. The developers were observed to be undertaking activities on the basis of ex post facto ECs which were made possible through two office memoranda of MoEF&CC, dated December 12, 2012 and June 27, 2013. NGT considered these office memoranda to be “ultra vires” to the Environment Protection Act, 1986 and the Environmental Impact Assessment Notification, 2006, and quashed them. The develo pers were allowed to continue on payment of a fine. MOEF&CC reacted to NGT’s decisions in a mindless way with little regard to the integrity of EC mechanism. In March 2017, it issued a notifi cation giving a six-month window to developers operating without a prior EC to apply for the same. These projects were to be re-assessed and cleared by the Centre. To make matters worse, in March 2018, the ministry allowed state clearance agencies (state expert appraisal committees and state environment impact assessment authorities) to also deal with such violation cases and clear them at the state level. This was done at a time when the capacity and accountability of these state-level authorities were already a concern. The ministry has also put in place its own mechanism to identify non-compliance with EC and decide fines and supplementary actions for violators. So, instead of resolving issues jointly, parallel mechanism now exist to deal with violations of EC. The underlying tension between NGT and MoEF&CC is also hampering NGT’s capacity. There is a growing apprehension among environmental practitioners and activists that the government is trying to weaken NGT. And the fear is not unfounded. With the mounting number of cases, NGT must have adequate judicial and expert members. The NGT Act says the tribunal should comprise a full-time chairperson and not less than 10 judicial and 10 expert members, subject to a maximum of 20 full-time judicial and expert members. However, going by NGT’s official website the five benches of the tribunal are now managed by only five judicial and three expert members, and an acting chairperson. Last year, the government also introduced the Tribunal Rule, 2017, invoking provisions of the Finance Act, 2017. The aim of the rules was to revise the appointment and removal criteria of chairpersons, presidents and members of various tribunals, including NGT, in which the bureaucracy will have a bigger say. Though the Supreme Court has ordered a stay on the rules this February and upheld appointment as per the NGT Act, timely appointment of NGT members did get affected. This has left the tribunal in limbo as several of its members, including the chairperson, completed their terms last year or early this year. The judiciary has a key role in environmental governance. To become effective, ngt’s internal procedures have to be strengthened. Also, a coordination mechanism needs to be institutionalised between ngt and the environment ministry where conflicting issues are discussed and resolved. This is the way ahead.